Taco Mac menu prices at your fingertips. Taco Mac is a chain of casual sports bar-style restaurants known for introducing Buffalo-style chicken wings to the Southeast USA. Chicken wings pair well with cold beer and Taco Mac has a wide selection of domestic and imported beers on tap and on rotation. To make it a trio, the founders added multiple TVs in each location so guests can watch live sports. Guests can’t just eat wings! The Taco Mac menu also includes burgers, flatbreads, sandwiches, and tacos. Below are the latest Taco Mac menu prices. Each Taco Mac location puts on several events every month. Be sure to sync your calendar with theirs so you don’t miss out on any upcoming events. Most events are centered around beer tasting of new selections. Sticking to a specific diet is made easier by Taco Mac. They provide a detailed nutritional value chart for all their dishes. Information is king and now guests can get the information they need to make proper food choices when eating at Taco Mac. The nutritional information can be found on the website or can be requested at the restaurant. The health and safety of guests are very important to Taco Mac. Taco Mac is committed to providing complete and accurate information regarding allergens included in their dishes. A list of 8 food allergens is provided online for customers to view prior to visiting a Taco Mac location. Be sure to advise server or restaurant manager of food allergies before you order. Now you can get your very own degree in beer tasting! Yes, you read that right. Homework involves beer tasting. And your grades? Earn credits for every new beer sampled. Earn credits towards higher degree status and get better rewards. With a wide and ever-changing selection of beers, guests can always earn credits and increase their beer knowledge. For complete details and sign up, check with your server. Hanging out with your crew at the local Taco Mac to catch the game is always an awesome time. But sometimes, life gets in the way but you still have to eat. Taco Mac makes it easy for guests to enjoy their favorites. Guests head over to the official website, choose a favorite Taco Mac location, pick their favorite wings, burgers or quesadillas, check-out & pick-up. Some emails are worth reading. Taco Mac’s email club provides members with the latest news and promotions plus details on Brewniversity and latest sporting news and upcoming games. Signing up is quick and free. New members will receive an FREE queso for becoming a member. Energetic, hard-working individuals that enjoy working in a fast-paced environment and strive to provide the best possible customer experience need to check out Taco Mac as a possible career launcher. Taco Mac is expanding and always seeking new team members. Candidates need to check out the Career page on the official Taco Mac website to learn more about the company, culture and current openings. 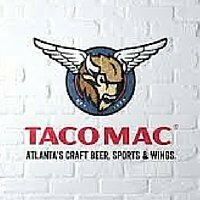 Taco Mac began in 1979 when a couple of friends hailing from Buffalo, New York on their way to Florida made a permanent pit stop in Atlanta. Craving their favorite bar food from back home, they decided to purchase a closed-up taco shop in the Virginia Highlands in Atlanta and open a joint that offered Buffalo-style wings. The concept proved very popular and word of it spread throughout the area. New locations started popping up all over Atlanta. The Taco Mac chain was purchased by the Tappan Street Restaurant Group and continues to be successful and expand. Today there are over 30 locations in Georgia, North Carolina, & Tennessee. For more information about Taco Mac, visit their official website.